The epidural space extends from the base of the skull to the level of the sacral hiatus. Below the level of S2, where the dura terminates, the epidural space continues as the caudal epidural space that can be accessed via the sacral hiatus that is covered by the sacrococcygeal membrane. The sacral epidural canal contains the sacral and coccygeal roots, spinal vessels, and the filum terminale. The epidural venous plexus is concentrated in the anterior space in the caudal epidural canal [1, 3, 4]. Caudal epidural injections are usually performed as diagnostic and therapeutic interventions in various lumbosacral pain syndromes, especially those where lumbar epidural access is not desired. The landmark technique for caudal epidural injections is complicated by variations in sacral anatomy and the risk of inadvertent intravascular injection.While fluoroscopic guidance is the most commonly used, it increases radiation exposure. 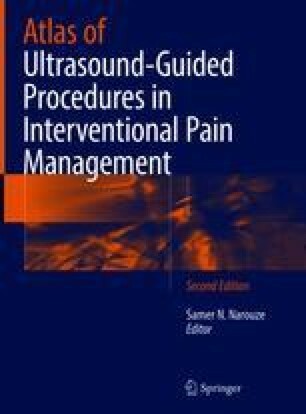 Moreover ultrasound guided techniques are as effective as using fluorosvopic guidance (15, 16). But ultrasound guided techniques are limited by lack of visualization inside the sacral canal thereby limiting the identification of epidural spread and inadvertent intravascular spread. It also remains a technically challenging technique.